The best way to ski your whole life is to start when you’re young. 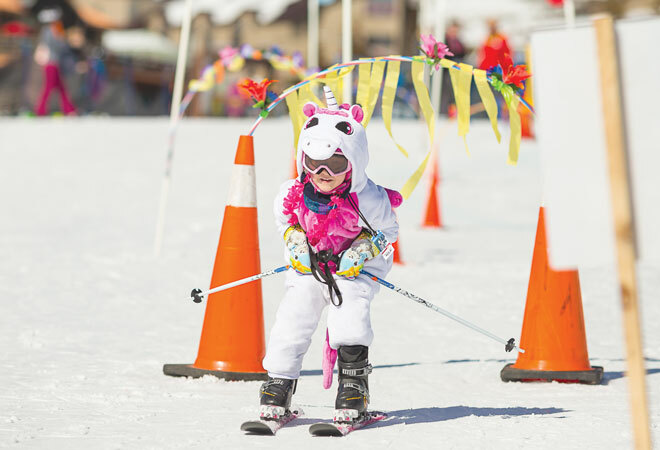 Last Saturday in one of the great traditions of Crested Butte, my three-year-old son, George, put on a costume and skied in his first-ever Mini Cruiser Cup. He was a punk rock unicorn, and besides the run where his horn got stuck in one of the hula hoops that had been set up as gates, he skied non-stop for nearly two hours while a community of other kids, parents and Crested Butte Mountain Resort ski instructors rang cowbells, blew horns and cheered. Long after the other kids and instructors had left the course, George was still lapping the magic carpet. When I finally convinced him to stop for a snack, he took off his own skis, placed them securely together and walked with them to the base area. It knocked me out. I always dreamed I’d raise little rocking skiers. I spent a lot of time during the winter of 2016-17 towing George around the streets of Crested Butte with a ski pole hooked to the edgie-wedgie at the front of his skis. We went up and rode the magic carpet at CBMR a few times, but as a very small two-year-old, my only real thought was to get him pumped on goofing around in the snow. This season, we signed him up for Mini Cruisers, one of a handful of programs CBMR offers for young local skiers. We committed to two hours each Saturday for nine weeks. On the first day of the program George was teamed up with CBMR instructor Cailen Mahoney, and before my husband could skate over and hop on the Silver Queen, Cailen had George shuffling around the beginner area. The next week Luca joined Cailen and George. They had themselves a trio, and the preferred ratio of students to instructors that the Ski and Ride School aims for in the Mini Cruiser program. Cailen kept the kids on the magic carpets for a few weeks making sure they could consistently “pizza” (make a wedge with their skis to slow down), turn and stop. Then at five weeks in without harnesses, edgie-wedgies or other tricks, she loaded them onto the Red Lady Express chairlift. They were officially skiing. More than that, they were skiers. Two-time Olympian and local son Aaron Blunck is a graduate of the resort’s local kids programming. According to Hartman, whom Blunk calls “Uncle Dave,” Aaron started out in Mini Cruisers when he was three or four years old, then moved up to Cruisers before joining the Mountain Sports team and eventually the U.S. Olympic Ski Team. And while Blunck is a special case with special skills, Hartman says every student involved in the program, which has been operating for more than 25 years, has the opportunity to develop their own relationship with skiing. On week seven of the program, Cailen took George and Luca up Red Lady, then up Painter Boy. When they got back to base area with time to spare, they took a bathroom break then made snow angels and played tag and hide and seek. On week eight they did the same circuit, except this time they skied over and watched the 13- and 14-year-old racers compete in the Prater Cup. That night all George could talk about was how fast the racers were going and how there was a girl with stars all over her speed suit. He bet that she was the winner and said she never fell. I asked him if he wanted to race and he said maybe when he was five. This year CBMR’s local kids programs enrolled about 265 kids. About 200 of those signed up for either Mini Cruisers, which serves kids aged two and a half to six, or Cruisers, which covers the four- to 12-year-olds. The remaining 65 kids are taking part in Mountain Adventurers—a new program this year for intermediate to advanced skiers and riders wanting to expand their mountain knowledge but not necessarily interested in competing. Combined, the local programs provide an opportunity to create the next generation of life-long skiers, and Hartman said he hopes the work being done in the program creates a pathway for kids to create a relationship with the mountains. Heather Jarochym, the supervisor of CBMR’s kids programs, adds that each instructor for the local kids programs is hand-picked. George by nature is not super independent. He’s most often content to let my husband and me put on his boots, carry his backpack and open the door. He’s an observer by nature, sometimes hesitant to jump into the fray at the playground or join in with activities at preschool. But something about skiing brings him out, makes him shine. When he’s skiing, he’s superman. He’s brave and proud and he encourages other kids to be brave too. As I thanked Cailen for everything she’d done for George during the program, she shrugged it off, but I know better. I love skiing and being on the mountain, and now thanks to Cailen and the Mini Cruiser program, George and I are getting to share that love. I don’t even have to carry his skis. To learn more about CBMR’s local kids programs, visit http://www.skicb.com/lessons-rentals/kids-local-programs.